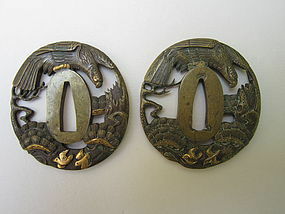 Two closely related soft metal (bronze or brass) tsuba from Edo period (1603-1867). These are from the 19th century. Each is approx. 2 5/8 inches long and 2 3/8 inches wide (6.5 X 6 cm). Both depict an eagle hunting two small birds in tufts of grass on one side. On the other side the eagle is poised over an empty landscape. Both with gilt highlights. Condition; some surface rust and wear to the highlights. 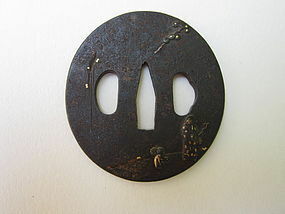 Interesting and humorous, perhaps the tsuba of a shy child now a samurai. 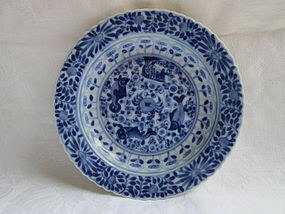 A Chinese thinly potted porcelain saucer dish with underglaze cobalt decoration. The central decoration of plants and grasses rising from rocks is surrounded by a two part border of different leaves of water plants. The flared upper rim is molded and the outer edge lobed. 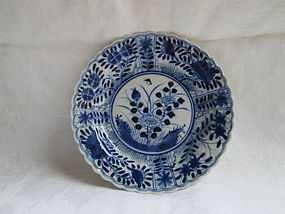 On the back in underglaze blue are two trailing plants. 1 inch (2.5 cm) tall and 5 inches (12.5 cm) diameter. 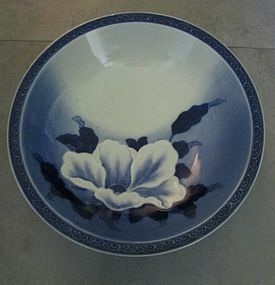 A shallow bowl with a molded the white flower (magnolia ? ), an everted rim and a high foot. 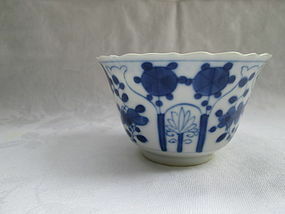 The fine porcelain, the comb decorated foot, cloud border on the rim and the stylized flowers on the outer side of the bowl are typical of Hirado porcelain made in the style of the earlier Nabeshima kilns. 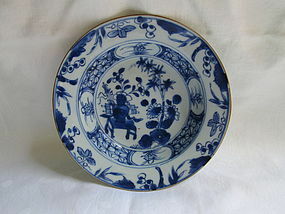 All of the decoration, including the characters on the bottom, is underglaze blue. 8 ½ inches (21.5 cm) diameter and 2 inches (5 cm) tall. 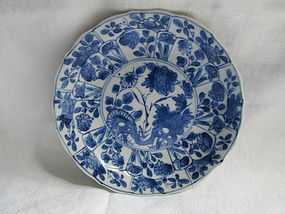 A Chinese export deep well plate decorated with blossoms and flowering sprigs in underglaze blue against white porcelain. Blue bands around the center, the top edge of the well and the rim. The outside rim is brown. The underside has no marks, a dry foot and a couple of loosely painted sprigs. 9 inch (22.5 cm) diameter. A Chinese porcelain early 18th century large handleless cup with hand painted underglaze cobalt blue decoration. On the inside a saw tooth band is between faint blue lines located near the ruffled rim and a scene of an insect above a flower and grasses in the bottom. On the outside are stylized flowers in jars, in lower arches and rising above the arches between the jars. The foot is high. Height 2 inches (5 cm) and diameter 3 3/8 inches (8.5 cm). 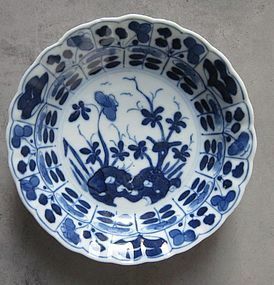 The thin shaped porcelain dish with a fluted rim that extends to a lobed edge is well decorated in underglaze blue with four large panels of flowers separated by four small panels of flowers surrounding the center decorated with a flowering plant and a flying insect. 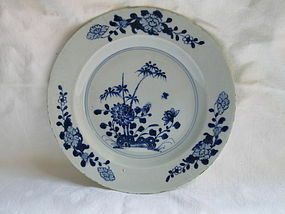 On the back are two flowers with trailing leaves and in the center the four character Kangxi mark enclosed in a double circle, all in underglaze blue. 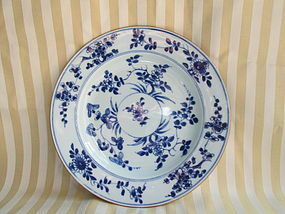 Diameter 5 3/8 inches (13.5 cm) and height 1 inch (2.5 cm). 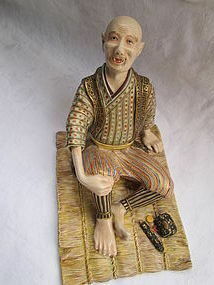 Kyoto Satsuma figure of an elaborately dressed elderly man seated on a rush mat with two small cases beside him. The man is nearly bald, missing front teeth and shows whisker stubble on his chin. On the other hand his vest is elaborately decorated with gilt flowers, and his pantaloons and leggings are stripped with gilding. Late 19th century. 5 inches (12.5 cm) tall, 5 ½ inches (14 cm) long and 4 inches (10 cm) wide. Condition: excellent except right foot re-stuck at the ankle. 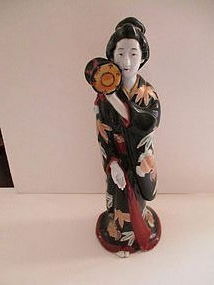 A well molded figure of a geisha holding a drum on her right shoulder with her left hand. Her open right hand is ready to rise and beat the drum. Her black kimono with red edges is decorated with bamboo fronds and a fruit or flower, both with gilt highlights. Her red obi is painted with colorful clouds. Her hair is elaborately piled on top of her head. 9 ¾ inches (25 cm tall).